Dr. Death is a scary one. 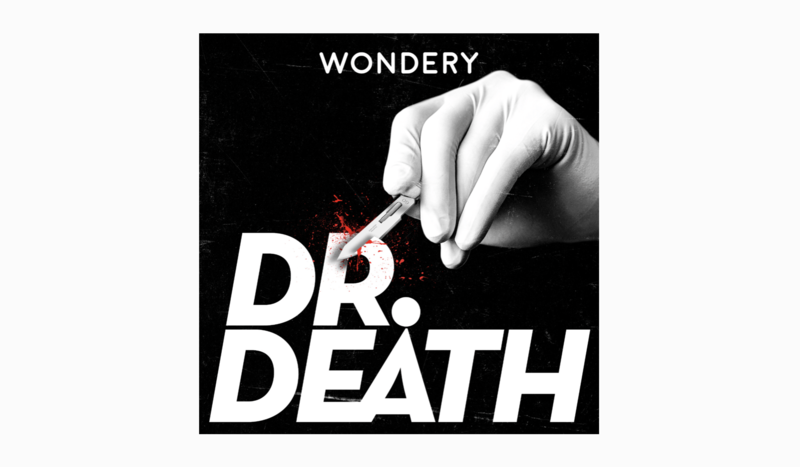 Laura Beil’s Wondery podcast, which just wrapped its official first season and will continue to release sporadic updates, tightly retells the story of Dr. Christopher Duntsch, the Dallas neurosurgeon who injured 33 of the 38 patients he operated on during his career. Beil’s job is to bring Dr. Death, a moniker assigned by the Texas media, to a national audience, and wonder what combination of incompetence and malice led to the tragedies. In its spectacular first several episodes, which report on the many botched surgeries Duntsch embarked on, Dr. Death is genuinely horrifying. The immense pain Beil chronicles, from paralysis to nerve amputations, is devastating — and the fact that this didn’t have to happen remains sterling clear. Beil tells us in the first episode that the podcast aims to expose the cracks in the medical system, and show how far malpractice can go before authorities are moved to action. It’s a smart angle for a true crime podcast in which the villain’s guilt seems assured from the show’s opening minutes. In the absence of mystery, the focus turns to how Duntsch was allowed to continue practicing after the first several disasters. Even after six exhaustively-reported episodes, Duntsch is something of a cypher. He grew up in Tennessee and Colorado, received a PhD and glowing recommendations by possibly doing more research than operation in medical school, then moved to Texas to begin his medical career. Across several hospitals in the Dallas area, Duntsch regularly took unorthodox approaches to surgeries, often turning routine operations into catastrophic events in his patients’ lives. One botched surgery paralyzed his good friend and business partner, another resulted in a sponge being left inside a patient’s back, and two left his patients dead. The retellings of the individual surgeries are stunning mini-biographies of the people who went to Duntsch on recommendations from other doctors and online reviews. Dr. Death doesn’t shortchange the personal tragedies of Duntsch’s malpractice, and is wise to hammer home the randomness of Duntsch’s victims. Beil is interested in the distance built into the health care system, how little we know, and how little there is to know, about the doctors we choose when we’re most vulnerable. The humanity of the true crime show comes out most when Beil reminds us that Duntsch’s occasional charm and assurances that he was capable of fixing any back problem probably would’ve worked on you or me, too. The realities of what Duntsch did in the operating room are physically uncomfortable to listen to. Beil methodically recounts what happened during some of the worst surgeries, and dedicates time to the aftermath in Duntsch’s patients’ lives. Beil’s patient biographies move the audience in the right direction, toward demanding an answer from the non-transparent and totally distant-from-normal-reality hospital administrations and medical boards. Despite Dr. Death’s valiant efforts, I leave the first season with little more understanding of how hospital administrations function, beyond the drive to protect themselves. Dr. Death does have its heroes though, the doctors who raised hell to strip Duntsch of his medical privileges. Dr. Robert Henderson and Dr. Randall Kirby, who at different moments were brought in to correct Duntsch’s botched operations, became insurgents in the Texas medical bureaucracy, asserting their own clout as surgeons to ultimately make Duntsch’s story public. Henderson is as much of a moral center as the podcast has, introduced in the first episode as a serious and sincere ideal of a doctor. The true crime boom has given us a number of solemn moral heroes. My mind goes to defense attorneys Dean Strang and Jerry Buting of Making a Murderer. Henderson is the good doctor, the one we imagine when we think about putting our lives into the hands of a medical professional. His sureness of tone is Dr. Death’s buoy, the reason for optimism about patient-doctor trust in midst of the heinous mistakes. The answer to why it took countless efforts for Henderson, Kirby, and a couple other advocates to bring down Duntsch is depressingly boring. The massive bureaucracies of hospitals and state medical boards do not seek out the opportunity to take responsibility for bad surgeries. Duntsch was repeatedly fired, and repeatedly resurfaced at different Dallas-area hospitals without being stopped by a larger body. The creators of Dr. Death don’t let us hear Christopher Duntsch’s voice until the penultimate episode. Many guesses are leveled about his psychology in the interim, but there’s a level of intentional separation between the real Duntsch and the audience. That choice is a fair one, focusing the show on the catastrophic effects of the surgeries than on the show’s “villain.” We get to hear from the survivors of the operations before and more often than the surgeon himself. The podcast seems willing to accept that Duntsch’s internal life is a mystery, and that expending too many resources on psychoanalyzing him would be likely fruitless and a little queasy. My early worry about the show, that it would spend too much time asking whether Duntsch is “crazy,” was largely dispelled by the final episodes. Many true crime shows fall apart when the narration must move on from the crime itself and onto often-dull legal proceedings. Dr. Death navigates the transition well, dedicating only an episode strictly to the trial. With the release of a first “update,” the podcast announced its plan to produce occasional episodes, which appear to take the form of a hosted Q+A with Beil about her ongoing reporting. Two weeks after the finish of its official season, Dr. Death looks like a phenomenon. What has made it such an immediate success is not only the shock of its content but also its local focus. Beil is based in Texas and has been reporting on Duntsch for years. The world-building in Dr. Death comes naturally, forgoing portraits of Dallas the town or its residents. The show is smart enough to launch into the straight reporting, letting the terrible drama of the case take priority over style.